Strife has many forms, and service has wide channels especially that our Cause is passing through different paths and conjunctions which will push toward changes in the growing process affecting directly the final shape of the Assyrian Cause in today's Iraq which is suffering on one hand from a weakness in the nationalism of its elite political (leadership) factions and on the other is suffering from the pains of a legitimized division through some rigid theories. As the struggle goes on between (the Iraqi interim leaders) around regional, denominational, ethnic, secular, party related and even Marxist gains, we notice the absence of the Assyrian Cause between the tides of a successive power marginalization and the ebb of the Assyrian political (chieftain) failure to have an exemplary suitable frame, something which the Assyrian Cause hasn't seen since 26 centuries. As a result the opportunities of realizing national goals subsided and the voices asking for the moral, legal, and historical rights for our struggling Assyrian people diminished, while one of the most important rights is … Our inveterate rural areas. Looking and searching into the fate of the Assyrian villages since the establishment of the Iraqi State in 1921, is considered to be one of the humble links in the long chain leading to the deep geographical history of the North of Mesopotamia (Bet-Nahrain) and in order to be precise in a research (without reaching the point of perfection) we have decided to leave it as an open discussion for all objective replies, as well as historical designation to adjust, add or cancel, thus for being extensive it was limited to the Assyrian villages annexed to the governorate of "Dohuk" , those which are inhabited by Assyrians or Arabized and Kurdified as well as those villages whose inhabitants were forced to migrate. The subject of this research is considered one of the important points which if denied then the beloved Iraq will not be able to have peace and democracy, for the historical and geographical rights remain distant from the boundaries of the narrow legal areas, especially if we pay close attention that the aim for legislation is to get the essence of the law rather than literary wording and language which can't be considered as a measure to cover up the conflicting interests. Thus, the geographical right of the Assyrian people (our historical rural region) shouldn't be an open range (a mere private property). Therefore, an individual or an organization shouldn't be allowed to relinquish it neither to sell it, give it away nor to bequeath it to any one except to Assyrians who have inherited and passed on this right for hundreds of years and who have the right to ask for it because it's the mirror which reflects the nobleness of Iraq and the tool which will guarantee the continuity of human civilization. What remains to be said is that our violated villages represent our looted freedom, and freedom is the innate right of individuals for which nations were perished, where civilizations reigned and others perished. For this right, peoples were interred and necks were put on the guillotine, while great ones were hung. For its sacredness rays of sun re-kindled after a relapse, that right which was legitimized by the laws of heaven and which was drawn with the blood of revolutionaries, this same right was denied by thieves of civilizations, humanity's tyrants and the promoters of false roots. Our geography is the word, the word is a responsibility and responsibility is freedom. For freedom and for it alone… history was made. (May 2004). Nohadra is the Assyrian name for the city, while some of the inhabitants of Alqosh and the villages of the Nineveh Plain refer to it since ancient times as (Att Tuk) Nohadra is one of the ancient Assyrian cities, where a visitor arriving from the governorate of Nineveh can see to his right in the mid northern section at the foot of the mountain signs of Assyrian sculptures dating back to the era of King Sennacherib (705-568 B.C.) and its neighbor is the village of Maltayeh. Maltayeh: Located five kilometers west of the centre of Dohuk, it's believed that the adjacent mound was the centre for the Assyrian city of Maltayeh (the word means elevated in Assyrian), on the top of this mound pottery from the Assyrian era spreads over where there was a military fortress, there are also other sculptures near Kali Dohuk in the White Mountain, it was inhabited by Assyrians since ancient times as well as some Jewish families (924 people) who left in 1949 and used to live in the Keri Basi district in addition to few Kurdish families who had immigrated from the Duski district in the last century when Assyrians and Jews were the owners of those lands (part of the metropolis) during the last part of the 1920's. The metropolis of "Dohuk" Nohadra had 400 homes concentrated in three districts Sheli Nasara which was later on called Brayti, the Keri Basi, and two lesser districts Sheikh Mohammad and Souk which were inhabited by a Kurdish immigrant majority who turned one of its Churches into the great mosque of Dohuk. The metropolis was joined to the Abbasid Bahdinan Emirate from 1258-1842 then it was joined to Mosul in Ottoman times when it was a regional centre until later when on May 27, 1969 it became the centre for Dohuk governorate (the 18th governorate of Iraq). A deal had been struck at the time between the central government in Baghdad and the Kurds to create the Dohuk governorate switching it for the oil rich Kirkuk governorate in order for the Kurds to refrain from asking for it without caring about its original inhabitants and the city's demographics. In 1923 "Dohuk" Nohadra had about 2700 inhabitants, that number climbed to 5621 in 1947, then it 1957 it was 7680, followed in 1965 to become 8603 and the official census of 1965 indicated that there was an opposite migration of 1201 of its original inhabitants since the beginning of the Kurdish movement and the noticeable increase of immigrants when its population in 1977 climbed to 36521. That number rose to 80347 inhabitants in 1983; the number of immigrant people to the city was estimated after 1968 at about 67 %; 84 % were from different regions and villages of Dohuk while 16 % came from outside the governorate thus residential areas increased from three in 1923 to 17 in 1983 with another increase after 1991; all these increases happened at the expense of its original population whereby most of the lands are agricultural thus with a simple decree from the government the land is zoned as residential and annexed to city hall and most of the time without any compensation. In this manner many private lands were appropriated by both the eradicated Baath as well as today's Kurdish regime which brought another innovation by legalizing the ownership of lands by trespassers, distributing thousands of residential lands to Kurds (martyrs' families, Peshmarga, employees and laborers, and party members). All these lands are agricultural belonging to Assyrians who aren't able to obtain any thing for them. The Assyrians in "Dohuk" Nohadra are presently estimated at 30.000 of the original inhabitants and neighboring villages while the immigrating Kurds from different regions and countries are estimated at double folds. The number of Assyrians who are from the governorate of Dohuk but scattered in different regions of Iraq and Diaspora is estimated at about 300,000 people. The Assyrian inhabitants of Dohuk were subject to different sorts of oppression and afflictions in the past ten decades at the hands of Kurdish intruders and meddlers to control the city's riches with the help of the authority there and its tyrannical laws against our people, here we mention as an example the killing of the brother of the singer Janan Sawa, Hanna Sawa (at his prime), in his orchard (in the centre of Dohuk today) at the hands of Saiid Diwali al-Duski who appropriated the orchard without remorse or even any one asking him about his horrible deed because the law of the jungle is practiced when it comes to Assyrians and this law is still in motion today in different ways. If the Kurds want to Kurdify a piece of land or violate a village then it's such an easy task to issue a decree from their parliament tailored to their measures for they don't need to resort to killing nowadays in order to control our lands because all that they want, they can obtain by stretching the law in any way they wish or want. "Malta"1 Maalthaya: According to the 1957 census it was inhabited by 130 people, it's one of the old Assyrian villages close to Dohuk . It had 30 homes inhabited by more than 70 families before 1961, later on and because of the political circumstances in the area, its people began to migrate especially following the killing of a man by the name of Toma and two of his sons at the hands of Kurds under claims of his involvement with the government. Kurdish settlements followed until the village was emptied of its original inhabitants except for few remaining families who left following the March 1991 uprising, while the Kurds took over and this was because of the exerted pressure to Kurdify the village completely something which was obtained with the help of the Kurdish government which had Kurdification as a priority. Masik: According to the 1957 census it had a population of 105, but they left in 1961 because of the increased pressure by both the government and the Kurdish militia for its vital location and being close to Dohuk. Its lands were turned into residential areas and were distributed to Kurdish employees in 1991. "Kanimase" Aina D Nouneh: It had 420 people as per the 1957 census. It's considered to be one of the largest Assyrian villages in the Barwari Bala region as well as the administrative centre for more than 32 Assyrian villages. It was inhabited by Assyrians since ancient times, its population left in WWI accompanied by the Assyrian leader Agha Potros to Urmia (Iran), seven years later they returned and settled till 1986 when they were deported by the government and the village was demolished because it was included in the regime's plot to empty the villages on the borders with Turkey. It had about 100 homes inhabited by more than 180 families. It was affected by the Barzani movement in 1961 whereby many of its population had left to avoid the problems which were caused by both the government and the Kurds. At present it's estimated that there are about 800 families that belong to the village, about 20 families live in it and they had returned following the March 1991 uprising, 150 families as well as many important figures of the village live in Diaspora while the rest of its people live in scattered areas in Iraq. Aina D Nouneh is one of the first villages where schools were established, its children were educated in different domains as well as having many teachers who contributed greatly to the education process and to politics throughout the country, however there is trespassing on its lands by both the government and neighboring Kurds. Dore: It had a population of 296 according to the 1957 census; it's one of the old Assyrian villages with its location at the Turkish border. It was included in the plan of emptying the border villages whereby it was destroyed in 1978. Its population accompanied the leader Agha Potros for seven years during WWI and later on they returned and settled. In the early thirties it was deserted because of trouble between the Turkish government and the Kurdish Emir of Barwari. This village before its demolition had 40 homes inhabited by 75 families before a part of its population left because of the 1961 events. Today there are about 30 families living in this village and they had returned following the March 1991 uprising and out of 200 families there are 100 who live in Diaspora and the rest are scattered in different regions of Iraq. Dore was famous for its Diocese of The Church of The East for Barwari Bala which was known as the seat of Mar Youala, there is some trespassing on the village's lands on the part of neighboring Kurds. Iqri: It had 25 homes inhabited by 40 families before 1961; its population was deported in 1978 and the village was demolished. Iqri is one of the ancient Assyrian villages and today it has 100 families; most of them live in Mosul, Baghdad, and Dohuk as well as few in Diaspora. Its population didn't return because of Kurdish trespassing on the lands following 1991 but they are ready to return once these trespasses are lifted. Malikhtha: According to the 1957 census it numbered 28 people; it's one of the small Assyrian villages where there were five families living there prior to 1961 and today they are about 35 families living in different parts of Iraq. No one returned to it following its demolition in 1978 when it was included in the borders plan. Malikhtha was famous for extracting salt from its salt water wells. Maghribiya: Was inhabited by 18 people according to the 1957 census; a small village which was inhabited by five families, it was deserted in 1961 with the beginnings of the Barzani movement, then its population returned until the authorities demolished it in 1976 for its location at the border. The village is still deserted till today and its 20 families are living in scattered areas of Iraq as well as in Diaspora. There is a presence of the P.K.K. militia on its lands. Cham Dostina: One of the small villages which was inhabited by three families who left during the 1961 events2 and returned following a relevant tranquility until 1976 when it was deported for its border location. One family had returned following the March 1991 uprising then they left again because of fighting between the militias of the K.D.P. and the P.K.K. The village remains empty while its 18 families live in different regions of Iraq. Sardashte: Its population according to the 1957 census was 250; it was inhabited by 40 Assyrian families before 1961 when it was subjected to a massacre where 32 of its men and youth in addition to the village's priest were killed at the hands of Abd al-Wahad Haji Mallo who was accompanying Malla Mustapha Barzani. Following this ugly massacre, its people left but returned again after the situation relatively calmed down until it was completely demolished in 1976 because of its border location. The village's mayor Aprim was the subject of assassination in 1970 because of his attempts to bring back the villagers and chase out the trespassing Kurds (from the adjacent Bet Kar village). Four families went back following the 1991 uprising but they soon after left because of the fighting between the K.D.P. and the P.K.K. The village's families are estimated at about 120 families living in different areas of Iraq and a substantial number in Diaspora. Sardashte was famous for one of her men by the name of Jaji Belati who was nick named the bounty hunter (he used to chase the criminals wanted by the government). Beth Tanureh: In 1957 its population was 25; about 15 Assyrian families lived in the village and inhabited five homes along side 15 Jewish families who migrated to Israel in 1949, and the village was destroyed in 1978 as part of the government's plan to empty the border villages and build compulsory residential compounds. Today the number of Assyrian families of this village is estimated at about 20 families living in Iraq and Diaspora, and the village has an old citadel as well as the remnants of a Jewish temple. Beqolkeh: It had a population of 74 as per the 1957 census, this was a shared village amongst the Assyrians and Kurds; there were seven Assyrian families in the village when they were deported in 1978 by the authorities as part of the plan to empty border villages, however the village had also been affected by the 1961 events when its inhabitants had left and returned once more. Today the estimate of its families is about 20 and they live both in Diaspora and in Iraq. Four families had returned following the March 1991 uprising3 but soon after they left because of the trouble between the K.D.P. and the P.K.K. and they never returned back again because the Kurds dominate most of the village's lands. Jideedeh: It had 24 families living in 10 homes and they suffered from 1961 till 1988 when the village was destroyed and its inhabitants had to flee because of the infamous Anfal operations. Today its Assyrian families number about 50 where 25 families are living in the village and the rest in different parts of Iraq while few are in Diaspora. This village was also inhabited by five Kurdish families. Tashish: According to the 1957 census its population was 163, the village was inhabited by about 60 families in 30 homes; it was deserted in 1961 because of the Barzani movement and only few families remained. Its inhabitants returned again in 1965 following a relative tranquility till 1988 when it was destroyed and burned in the Anfal operations. The village's families today number 160; ten families live in the village while 50 families live in Diaspora and the rest in different regions of Iraq. There is trespassing on the village's lands by the people of the adjacent Khashkhashe village. Maye: As per the 1957 census its population was 80 people, and was inhabited by 30 families in 15 homes as its sister villages it was affected by the events of 1961 but its population remained in it until 1978 when it was finally demolished by the Iraqi authorities under the pretence of emptying border villages. Today its families are over 70, ten families live in the village, some are in Diaspora and the rest in different regions of Iraq. "Bashmiyaye" Ishmaela: According to the 1957 census it had a population of 163, with more than 60 families living in 30 homes that is before 1961. In 1978 it was demolished because it was included in the plan of emptying border villages. At present it has more than 100 families but only 12 families live in the village while the rest live in scattered areas of Iraq and in Diaspora. Tuthe Shimaye: As per the 1957 census its population stood at 45; its inhabitants left following the events of 1961 when they were about 15 families living in 6 houses. Its population returned later on following a relative calmness to live until 1988 when it was demolished and burned down during the Anfal operations. Today its Assyrian families are about 40, but only six families live in the village while the rest are scattered in Iraq and Diaspora. Tuthe Shimaye is today shared with Kurds when before there were only three Kurdish families living in it. Derishke: Its population was 167 as per the 1957 census, it's a shared village with the Kurds and their part is called Derishke Islam. Its people didn't leave the village until 1978 because they were included in the emptying of the border villages plan, thus the village was completely destroyed. Its Assyrian population was about 50 families living in 30 houses. At present its families are about 150, 20 families live in the village, 15 families are in Diaspora and the rest live in different regions in Iraq. The village was famous for extracting raw iron which was used in making agricultural tools and equipment. Bebaluk: As per the 1957 census its population was 50, and the village was inhabited by some 25 families living in 10 homes, until 1961 when its mayor and few other villages were killed due to shelling by Iraqi planes thus people began to leave but they didn't completely empty the village until 1976 when its population was deported because it was a border village with Turkey and it was included in the borders plan. Following the 1991 uprising few families went back but soon after they had to leave because of the fighting between the K.D.P. and the P.K.K. Its people never returned again because of the many trespasses on its agricultural lands by the Kurds of the Spindar and the Bet Kar villages. Today it has 100 families living in scattered areas of Iraq and a small number in Diaspora. Khwara: It has a population of 92 as per the 1957 census; it had 10 houses before 1961 but it was tremendously affected by the events of that year. Following the declaration of March 11, 19704 its inhabitants returned until 1976 when it was demolished by Iraqi authorities being a border village, thus its population of 40 families didn't go back and today some of them live in Iraq and others in Diaspora. Botara: According to the 1957 census its population was 43. The village was inhabited by 12 Assyrian families living in 6 homes and few Kurdish families until 1961 when it was deserted but then its people returned back following the March 11, 1970 declaration where they lived until 1976 when it was deserted yet again because the Iraqi authorities demolished it as part of their plan for the border villages. Its inhabitants didn't return since then which are about 30 families. Presently it has P.K.K. militias. Halwa: As per the 1957 census its population was 194, with about 40 families who deserted it after 1961, later on some returned following the declaration of March 11, 1970 and they stayed until 1976 when its people were deported and the village was demolished as part of the borders plan. At present it has more than 100 families who never went back after its demolition because it's under the control of the P.K.K. militias, a situation which is affecting many Assyrian villages located at the borders. Mergajiya: As per the 1957 census its population was 49. It was affected by the events of 1961 but its people were always the first to return to the village even under difficult circumstances and they would go back to their normal lives as soon as possible. In 1988 there were 20 families in the village and in that year it was included in the disgraceful Anfal operations. Today the village has about 30 families, out of those 15 went back following the March 1991 uprising and the rest are scattered between Iraq and Diaspora. In 1970 the village's mayor Youkhana Odisho Zaia was assassinated in Hese but his assailants remained unknown, this of course happened to many Assyrian villages in that period and it was most probably a plan on the part of Kurds to terrorize Assyrians forcing them to leave their villages and all the assassinations were registered against unknown. From 1980 onward there had been trespasses on the lands by neighboring Kurds from the Akmala Village. Hiyyis: According to the 1957 census its population was 194, with 35 homes inhabited by more than 60 families. With the beginning of the Barzani movement in 1961, its population began to migrate especially when the village was burned down that year, then following a relative calmness in 1963 a large number of its people went back, they rebuilt and remained in it even under the difficult circumstances, until it was the year 1988 when it was demolished during the Anfal operations while what was left of the village's crops was burned following the March 1991 uprising which coincided with the return of the Kurdish refugees to the area. In 1987 trespassing Kurdish families attempted to build a mosque on the remnants of the destroyed village's Church (demolished by the Iraqi authorities) but the villagers opposed that and instead they donated a piece of land to the Kurds to build their mosque. A week later following this suggestion at the local Dohuk committee of the K.D.P. (which controlled the villages at the time) an Assyrian man Guiliana Khoshaba was assassinated in his home as well as Youram Youkhana a twenty year old Assyrian young man, and of course both assassinations were registered against un known, while no procedures took place even with the continuous attempts on the part of the victims' families. At present there are 150 families, five of which live in the village while 20 families are in Diaspora and the rest live in different regions of Iraq. Hese is famous for its son Rayis (chief) Esha D'Hese who is 80 years old and is still demanding that trespasses be lifted off his village. It's worth mentioning that trespasses on the village's lands and water resources never stopped since 1961, through March 29, 2004 on the part of both the former Iraqi authorities and Kurds. Kani Belafe: As per the 1957 census its population was 190, before 1961 there were 35 houses inhabited by more than 70 families when it was affected by the events of that year just like the other neighboring villages thus its people left and then returned and settled once again until 1988 when the village was completely destroyed. This is one of the old Assyrian villages with historical relics and it was also the home for some Jewish families. At present it has 200 families, 15 of them live in the village and about 80 families are in Diaspora while the rest live in different parts of Iraq. There are many trespasses on the village's lands before and after 1991. Mosaka: It had 128 people as per the 1957 census, the first migration for its people was after 1961 and they returned once more when the situation calmed down relatively. The situation remained as such between leaving and returning until 1988 when the village was completely destroyed in the infamous Anfal operations. Today it has about 110 families; seven of them live in the village (they had returned following the March 1991 uprising) while some are in Diaspora and the rest in different regions of Iraq. In 1961 one of its distinguished men by the name of Ishaq Giwargis was assassinated and as usual it was registered against unknown, then in 1987 the village's mayor Nanno Giwargis was also assassinated while on his way back from the K.D.P. Amadiya committee in adjacent Beshele village because of a problem which had happened between the villagers and trespassing Kurds and one Nono Eskharia was injured as well but he was able to identify the killers, however the K.D.P didn't take any measures against the killers because it was involved in the incident. Baz: According to the 1957 census its population was 130; 40 families inhabited the village in 20 homes before they began to migrate in the beginnings of the Kurdish movement in 1961, but a group of families remained attached to their land until 1988 when it was destroyed and burned down in the disgraceful Anfal operations when also five of the village's inhabitants disappeared and their fate is not known till today. Since 1961 there are trespasses on the village's lands by the Kurds of the Banafi village and its Church was turned into a mosque. At present the number of its families is about 70; ten of them live in the village and the rest are scattered in Iraq and Diaspora. Chaqala: As per the 1957 census its population was 103. Before 1961 there were about 20 families in this village and they left it after that date and they returned following the declaration of March 11, 1970 till 1978 when the village was destroyed and burned down because it was included within the emptying the villages which were on the borders with Turkey. Today 10 families live in the village out of 60 and the rest live in different parts of Iraq while two families are in Diaspora. The village's men worked as blacksmiths since the time of the Assyrian Empire till today where they have their own shops in Dohuk, as well as agriculture. Challik: Its population was 519 as per the 1957 census; it's considered one of the large Assyrian villages and was divided into two parts, upper Challik and lower Challik. In both parts lived more than 400 families in 200 homes. It was deserted in 1961 with the beginning of the Kurdish movement which affected most of our villages in the North. Most of its population returned following the declaration of March 11, 1970 when the situation relatively stabilized until 1979 when it was demolished by the Iraqi authorities for its border location. Today the number of its families is more than 1000, with only 10 families living in the village and they had returned after the 1991 uprising while more than 200 families live in Dohuk, "Bersive" Bersawa and the rest are scattered throughout Iraq and Diaspora. Following the 1991 uprising the Kurds began with their trespassing and built 80 homes on the village's lands even though the villagers protested to that and there are other trespasses on the agricultural lands of the village as well as some properties in the area of Bekofa which were appropriated by a Salim Blijani al-Kurdi supported by the Kurdish government, in addition to that the village's mayor Hermiz Oshana was subject to assassination in 1970 when many other Assyrian mayors were subject of assassinations in order to scare every one out of their villages so that the Kurds would appropriate the villages and lands without being accountable for these crimes. In March 2004 the Kurds burned the village's Spindar trees belonging to the Assyrian peasants estimated at more than $2,000.000 dollars and ofcourse no measures will be taken and as usual the crime will be registered against unknown, thus preventing the peasants to even think of re-planting new trees. In an attempt to throw dust in the eyes and quiet down the voices of the distressed peasants, the K.D.P. compensated them with an amount of $21,000 dollars in May of 2004. Iyat: According to the 1957 census its population was 169, with 35 families living in 20 homes before 1961 when some families left, but the village wasn't completely emptied until 1978 when it was included in the borders plan of the Iraqi authorities, presently there are five families living in Iyat following the 1991 uprising. Hurke: It's close to Challik (Challik Nasara) and its inhabitants were forced to leave it in 1928 because of the Kurdish oppression following the killing of a young man Toma Hermiz Khamo as he was sheepherding at night and because the authorities didn't take any measures against the killers, the ten families which used to live in the village took refuge in Challik and since then the Kurds took control. Hurke has an ancient Church carrying the name of Mar Qardakh. Dargale: An Assyrian village located between Hayis and Mosaka; its inhabitants left it in 1950 because of the great oppression which was practiced upon them by the Kurds trying to take over the village, and till today we can see the remnants of Mart Shmouni Church which was built in the first centuries of Christianity. Chammike: The village had 20 families who lived in 10 homes. It was looted and burned down many times after 1961; its people didn't go back because of the inconsistent political situation and Kurdish greed to take over the village. Two families had returned in 1970 following the declaration of March 11 but soon after they were forced to leave because they were not able to live under continuous pressure and oppression against them by the Kurds, on the other hand the village is being exploited by the Kurds supported by the Kurdish government. Tirwanish: An Assyrian village and its name means Dair Wanis = Wanis Monastery it was equally inhabited by the Kurds, but it's the property of two Assyrian brothers Khammo and Sliwo Bezizo as well as Mallik Khoshaba Yousif. Tirwanish is considered one of the villages, kurdified after 1991; at present a settlement of 2000 residential units is being built on its land in addition to other service units. Bazeeve: Inhabited by Assyrians since ancient times but who had to flee it in 1942 because of Kurdish oppression and injustice in their attempts to control the village something which they were able to achieve when they killed four of the village's inhabitants without any measure being taken against the criminals. Becozanke: An Assyrian village; kurdified after 1961. Sarsing: It was built in 1922 on remnants of an old Assyrian village; it had 40 homes and more than 100 families. The Mar Matteh (St. Matthew) Church was built on the ruins of Mar Matteh Monastery where plaques were found inscribed with the name of the old monastery. Then another shrine was built for the Mar Giwargis (St. George) Church where also remnants of an old Mar Giwargis the Martyr monastery were found, which the King in the early 1950's had ordered to be built but then it was demolished in 1977 to build the Italian tourism hotel which burned down in the mid 1980's and was located on the west side of the village. In the early 1960's there were 80 homes inhabited by more than 150 families with a population of 700. The Sarsing area was considered one of the tourist attractions and as such it was given attention by the Tourism Directorate which established on its lands units for tourists, residential areas, a movie theatre, hotels and restaurants. Rayis (chief) Khames Dinkha, Khoshaba Bodakh and Benyamin Youkhana are few of its distinguished men, as well as Reverend Audisho son of Reverend Eskharia who had gained favour with Abd al-Elah, King Faisal's guardian; Abd al-Elah had built a palace in Sarsing where he used to stay with King Faisal II in summer time, the palace still exists but it was converted into a hospital in the mid-nineties. Sarsing is also considered the first village in the Sapna area to have had an elementary school and amongst its notables is the scientist Dinkha Jona Mikhael who worked in Baghdad as one of the nuclear scientists and he has a doctorate in nuclear physics; he left Iraq following March 1991 uprising. Other diligent sons of the village were Eshaia Eshoo who was known for his national and patriotic strife; presently he lives in the United States and visits Iraq every year. One notable person to mention also is Lieutenant Youkhana who was famous for being brave, his love for his fellow Assyrians and was highly respected by all. He was killed in the village of Aradin Islam along with 47 Assyrian military personnel (read about the village of Enishke). The Assyrian population in the village live in a state similar to being besieged because of the increased settlements which had begun in 1973 during the negotiations between the Iraqi authorities and Mostapha Barzani who gave orders to settle the inhabitants of the Kurdish villages of Aradin Islam and Kani Janarki on the lands of Sarsing (the north and west sides) and in 1993 Masoud Barzani gave orders to re-settle the people of the Kurdish Jia village (part of Arbil's governorate) on the lands of Sarsing to the east, and he provided them and very quickly with all that they needed to re-settle. Moreover, there are Kurds in the tourist accommodations and all those continue their trespassing on the village's lands and water resources in addition to the continuous attacks, pressure, and oppression that the Assyrian population faces in its daily life. Therefore, the Sarsing area has turned into a Kurdish colony, adding to all, the assassination of many distinguished men during the past decades. Today Sarsing has more than 1000 families but only 150 of them live in the village while the rest live in different regions of Iraq and quite a large number in Diaspora. Daoudiya: According to the 1957 census it had a population of 524; with about 120 houses built before 1961 inhabited by more than 150 families, who began to leave after that year to different cities just like all other Assyrian villages but they would return depending on the circumstances and tranquility; this continued until 1987 when the village was demolished as being part of the border line villages which was to be emptied of any inhabitants. Following the uprising of March 1991 about 15 families returned to the village while the rest live in scattered regions of Iraq and the Diaspora. There are also trespasses on its agricultural lands whereby 20 Kurdish families were settled on these lands supported by the Kurdish government. Tinn: As per the 1957 census its inhabitants were 362; few families had returned lately and they are living in tents with the hopes of reconstructing the village. Dihe: According to the 1957 census it had a population of 292; the village was inhabited by 100 families in 44 homes built with Bazi stones. Before 1961 there were 615 people in Dihe when forced migration began because of the abnormal circumstances in the area. Today it has 300 families, 20 of them live in the village they had returned following the 1991 uprising and the rest live in different areas of Iraq (One family was killed because of a car bomb which exploded after being hit with an American missile). There are trespasses on the village's lands as well as its water resources by neighboring Kurds from the villages of Ars, Hamza and Pank; these trespasses increased even more following the killing of its mayor. The new mayor Benyamin was recently deposed by the K.D.P. and it appointed one of its followers and also has been known his cousin Rayis (chief) Eyou who lives in Danemark as well as Benyamin's brother Youkhana who was killed in the mid 1960's along with a group of Assyrians in Kali Dobri in the region of Nahla. The assassination of the citizen, Shimshun Elisha, in 1974. The assassination of the citizen, Dinkha Eshaia, the village's mayor in 1981. Assassinating two of the village's young men, Sami Goriel and Salem Dawood in 1975. The assassination of the citizen, Nona Daniel, in 1961. Benatha: The village was inhabited by more than 60 families in 30 homes built before 1961.Its inhabitants fluctuated between leaving to the cities and returning to the village depending on the circumstances and the level of tranquility. Today the number of its families is at about 150, eight of these families live in Benatha and the rest in different regions of Iraq while 30 families are in Diaspora. There are many trespasses on the village's lands by neighboring Kurdish villages supported by the Kurdish government because it doesn't take any procedures against those trespassers, something that paves the way day after day for further trespasses and hinders the return of the inhabitants who wish to return. Enishke: As per the 1957 census its population stood at 333. The events of September 1961 were a direct reason in destroying and burning the village on the part of the Iraqi authorities and the mercenaries of the Zibari Kurds to scatter its population to neighboring villages as well as larger Iraqi cities, almost all had returned following the March 11, 1970 declaration and began to rebuild the village anew. In 1974 a part of its population migrated again at the collapse of the agreement between the central authority and the Kurds. Enishke had about 50 homes inhabited by more than 120 families, today the number is close to 450 families, but only 30 families live in the village while the rest live in different parts of Iraq and Diaspora. There are many trespasses on the village's lands on the part of the Kurds inhabiting the tourists' facilities as well as trespasses on the village's agricultural lands while the Kurdish government doesn't take any measures to prevent that. Enishke has suffered tremendous persecutions at the hands of Kurds, such as the assassination in 1991 of the citizen Francis Toma by un known as he was sitting in his garden. The village's inhabitants were able to reveal the killers who were hired by the K.D.P. partly because the victim was the brother of Malko who was appointed by the Iraqi authorities to establish an Assyrian group which was called the Malko group (just like the hundreds of Kurdish mercenary groups which were founded during the Iraq -- Iran war); The Assyrian group lost 47 of its members when they were ambushed by their own army commander Mane'a abd-al Rasheed al-Takriti (later on was the Director of General Security) and the Peshmarga forces as the Malko group was conducting search operations in the village of Aradin Islam in 1986 when they were intentionally bombed but the whole matter was registered as a distance miscalculation. Badarrash: It had 30 houses before 1961 when it was destroyed and burned down by the Iraqi authorities thus its inhabitants deserted it to the cities and other villages. Today it has about 70 families, 40 of them live in the village while the rest are scattered between the different areas of Iraq and Diaspora. Duhoke: As per the 1957 census it had a population of 120; its Assyrian population of the Tkhoma tribe deserted it to Syria following the Assyrian uprising in 19335 because of their fear of retaliation and eradication just like what happened in Simeleh (Simel). In the early period of 1936, 30 other Assyrian families inhabited Duhoke until 1961 when the number of families had risen to about 60 when the village was burned in 1962 and its population scattered to different parts of Iraq. They returned again in 1964 to rebuild it but they had to leave yet again in 1965 so the re-building was incomplete. Following the March 11, 1970 declaration its inhabitants returned once more and settled until March 1974 when the Iraqi -- Kurdish agreement collapsed, however in 1977 the village was finally completely destroyed by the Iraqi authorities. At present the Duhoke families are about 100 half of them live in different regions in Iraq and the other half are in Diaspora while the Kurds gradually took over the village since 1974 exploiting its agricultural lands until today when it turned into a Kurdified village with the support of the Kurdish government. Belejane: According to the 1957 census its population stood at 238. The inhabitants of this village were brought by the Assyrian leader Agha Potros from their village of Ardel near Barzan because he feared for their lives from the Kurdish revenge and violence when he burned down Barzan in 19206 so he brought them to Baqouba and they chose to go to Belejane. In 1961 when it was burned down the village had more than 32 families living in 15 homes; later the village was destroyed and burned down again in 1966, then in 1987 the Iraqi authorities completely demolished Belejaneh. Today, the number of families is 60, 15 of them live in the village while the rest are scattered in different areas of Iraq and a large number in Diaspora. The village gave martyrs on the path of the Assyrian national strife such as Yousif Toma Hermiz and Rophael Nanno. Hermiz Toma the father of martyr Yousif is considered one the distinguished personalities in our Assyrian society because he offered the ultimate sacrifice for the stature of our people and nation. Bubawa: In 1957 it had a population of 85. Its population was made up of the Assyrians who had fled the village of Dargale in Barwari Bala caused by the Kurdish persecution (see Barwari Bala region). The village was looted, ravished and burned down in 1961 just like many other Assyrian villages thus its residents of more than 12 families had deserted it but some of them returned following the March 11, 1970 declaration and they remained in the village until 1988 when Bubawa was demolished in the infamous Anfal operations. Today its families count for about 30 and it can be considered as shared by the Kurds because its inhabitants didn't return following the submersion of most of the village's lands by water from the lake which was constructed by the eradicated regime of Saddam Hussein. "Kwane" Komane: As per the 1957 census it had a population of 550; in 1961 it had 150 homes built of stone and clay. In 1963 the first primary school was built in it and in 1965 the village was burned down and looted by the Zibari Kurds followers of the Iraqi authorities lead by Zubair Mahmoud al- Zibari killing one of its citizens and forcing to flee the rest who took refuge in neighboring villages. In 1977, 100 residential units were built to re-settle the displaced people in forced communities thus 20 Assyrian families from the villages of Nirwa were re-settled and 80 Kurdish families. Today its families count for more than 300 with 100 families living in the village and the rest are dispersed throughout Iraq and Diaspora. Dere: According to the 1957 census it had a population of 323, with 50 homes inhabited by more than 100 families when in 1961 its population began to migrate and their existence in the village dwindled because of the political conditions as well as the persecutions committed by both the Kurds and the consecutive Iraqi regimes until 1987 when the village was completely destroyed as part of the regime's plot to re-settle its inhabitants in coerced communities. One of the important historical relics of the village is the Monastery of Mar Odisho which was bombed by the regime's planes in 1961 but it was rebuilt in 1984 however the Iraqi authorities destroyed it yet again in 1988. The village's families are about 250 but only 25 families live in Dere while the rest are scattered within Iraq and Diaspora. There are as well trespasses on the part of Kurds from the villages of Mirstik, Kwezi and Ballout who are living on the village's lands and trespassing on its agricultural lands. We know of the village's people its current mayor Elias and the millionaire cousins Younadam and Andrawos residing in the United States of America. "Bebad" Bebede: As per the 1957 census it had a population of 480. The village was inhabited by more than 100 families in 1961 when they were forced to flee when it was burned down by the Zibari Kurds mercenaries under the command of Zubair Mahmoud al-Zibari known for his love of revenge and ravishing the Assyrian villages. In 1963 following a relative tranquility its residents returned but they continued to flee and return until 1987 when it was completely destroyed while the remainder of its population was forced into coerced communities. At present the number of its families is more than 200, 30 of them had returned to live in the village after the March 1991 uprising while the rest are dispersed in Iraq and a large number are in Diaspora. Bebede was known for its advanced administrative skills whereby elections were held to choose one of its dignitaries to represent the village before the Iraqi authorities and manage its affairs. One of its personalities, Toma Yousif Toma was the chairman of the city hall council of Amediya in 1914 and during WWI; he was executed in Mosul along with his friend Beto el-Rayis from Aradin for their national activities. Bebede became the quarters for the Patriarch Mar Ishai Shimun following the migration from his headquarters in the Qodshanus in order to be able to look after his parishioners until 1933 when he was exiled with his family to Cyprus following the gruesome Simele (Simel) massacres. The village was also famous for teaching the Assyrian language in the school which was established in1908 by the English missionary, orientalist, and spy William Wigram; that school is without a trace today because its stones were used by the Iraqi regime to build military barracks. Hamziya: According to the 1957 census its population stood at 102. Its residents left because of the 1961 events and they didn't return because it was made a Kurdish settlement. One of its sons was the famous pilot Emmanuel who had bombed the Presidential Palace during the dark Baath coup in 1963 he was killed when his plane was blown up by the Baathis to get rid of him following the completion of his mission. The other son of Hamziya was the martyr Youkhana Eshoo Jajjo who in 1985 was executed in Abou Gharib prison because he was one of the founding members of the Assyrian Democratic Movement. Kane Hajer: It has been Kurdified after 1971. Barazanke: As per the 1957 census its population was 241. It's situated between the villages of Daoudiya and Dihe. It was inhabited by about 60 in 33 homes. The village was completely deserted after 1961 and today there are about 140 families, 60 of them live in Diaspora while the rest are dispersed in different regions of Iraq and the village is considered to be completely kurdified. Sardarawa: In 1957 its population stood at 99. It was kurdified after 1961. Sikreene: Its population in 1957 was 475. Hawintka: Its population in 1957 was 63. Mahuthe: One family used to live in it until 1988 when it was destroyed in the infamous Anfal operations and then it was completely kurdified after 1991. Meristik: There are trespasses on its lands after 1991. Tazeeke: As per the 1957 census it had a population of one hundred and twenty-three. It was kurdified after 1961. Ashawa: According to the 1957 census its population stood at 619. It was kurdified after 1961 then it was appropriated by the Iraqi authorities which made it part of Saddam's palaces. The Kurds took control of it in 1991. 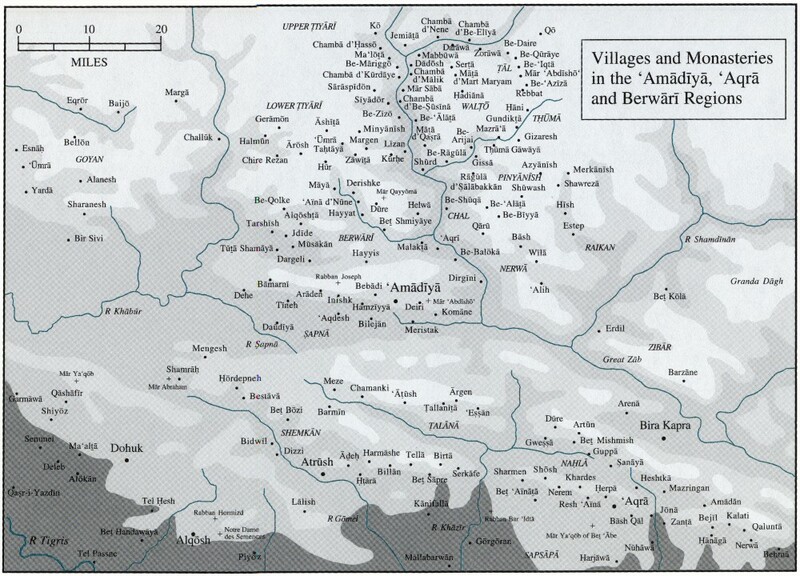 Amediya: The constituency of Amediya, was called Amat during the era of the Assyrian Empire and was always the target of greedy invaders but it remained a safe fortress for its population and it's still inhabited by some Assyrian families while the Jews who used to live there left in 1949. Amediya is a historical fortress with a deeply rooted history which attracted the interest of researchers. Gerbish: According to the 1957 census Gerbish was divided into two parts: Lower Gerbish with 192 people and Upper Gerbish with 182 people. The village was inhabited by Assyrians from the "Nestorian" and the "Catholic" denominations7 with about 210 families living in 75 houses, but they had to leave after 1961 and never returned because of the threats by the Zibari Kurdish tribes who were collaborators with the Iraqi authorities taking advantage of the situation in order to appropriate Assyrian villages. At present its original inhabitants who are more than 500 families are dispersed all over Iraq with a substantial number of them in Diaspora. This village is unjustly kurdified and its population is still waiting for the Zibari Kurds to leave their lands so that they can go back to their village. One of its known sons was the martyr Micho Mirza Sliwo (Peris) who was martyred at the hands of the P.U.K. militias (Kurds) in 1996 along with the martyr Samir Moshe. Duwriya: As per the 1957 census it had a population of 134 and there were more than 35 families in 1961 when they had to leave the village because they were besieged by the Iraqi government supported Zibari Kurdish tribes who were taking advantage to execute the Iraqi authority's plots in order for the Kurds to be able to appropriate the Assyrian villages and Kurdify the region. The Zibari Kurds attacked the village and killed Yaqo and Ishaq the brothers of the village's mayor Odisho Yalda who was known for his courage, gallantry and generosity and they also killed his brother in law Khoshaba Kako, in addition to a 14 year old young woman who was in the rice fields, thus the village's population had to flee to Aqra and from there to Mosul because they had no one to defend them, protect their honor and properties. So the Zibari Kurds entered the village and began their pillage and looting overtaking the village till today. In 1991 the village's Assyrian inhabitants presented the Kurdish government with a formal request to vacate their village but to no avail because there is no one to listen to the truth and right. At present the 70 families of Duwriya are scattered within Iraq and a number of them are in Diaspora. Kohana: The Assyrians bought the lands in the village legally and invested them until 1955 when they were rented to some Zibari Kurds in order for both parties to benefit in equal shares at that point there were 20 Assyrian families until 1973 when another group of Zibari Kurds chased out the Assyrian landlords and took over the village forcibly and now they claim its ownership even under protests by the owners of the lands. Today the village's original inhabitants are about 50 families dispersed in different regions of Iraq and Diaspora. Kashkawa: As per the 1957 census the village has a population of 174 with 100 families living in 30 houses before 1963 when it was burned down because some of its men were within the Kurdish movement thus Daniel Toma, Moshe Zaia, and Youkhana Shammas were killed. Its population left and then returned back following the declaration of March 11, 1970 where they settled until 1987 when the village was completely destroyed by the Iraqi government for being considered one of the forbidden areas and its inhabitants were forcibly moved to another residential community near the constituency of Aqra. The village today has more than 250 families with 30 of them living in the Kashkawa, they had returned after the March 1991 uprising while the rest live in other regions of Iraq and Diaspora. There are numerous trespasses on the village's agricultural lands even though its inhabitants continue to protest. Khalilane: According to the 1957 census it had a population of 28. The village was burned down and demolished several times after 1961 and continuously until 1987 when it was demolished for the last time and its families of about 25 were moved to the obligatory Aqra constituency residential community. Today there are 40 families, 20 of them had returned to the villages following the 1991 uprising and the rest live scattered within Iraq with few families in Diaspora. Cham Sine: In 1957 its population stood at 127. The village was inhabited by more than 30 Assyrian families who were forced to desert it for the second time in 1974 because of the planned persecution by the Zibari Kurds to appropriate the village even though there are formal documents proving its Assyrian ownership. Today there are more than 70 families living in different regions of Iraq and Diaspora waiting for the Zibari Kurds usurpers to vacate the village in order for its population to be able to return back and re-settle. Hizane: In 1957 the Upper Hizanke had a population of 44 while the Lower Hizanke had a population of 210. In 1961 its 100 families who were living in 42 houses deserted their village with the beginning of the Kurdish movement and their presence decreased depending on the political conditions in the area whereby the village was burned down twice in 1964 and 1969. Today its families are more than 200 but only 50 of them live in the village and they had returned following the 1991 uprising while the rest live in dispersed areas of Iraq and Diaspora. Moreover there are trespasses on the village's agricultural lands by the Kurds from the Bagerman Kurdish village. The village also lost some of its men like Yalda Eshoo Zadoq, Toma Enwiya Toma, Eshoo Goriel Khoshaba, Mikhael Lazar Mikhael. Zjulle: In 1957 it had a population of 88. This village was burned and looted four times from 1961 until 1987 when finally its 34 families had to desert it. At present there are more than 80 families with 20 families living in the village after the March 1991 uprising and the rest live in different regions of Iraq with a smaller group in Diaspora. There are also trespasses on the village's agricultural lands by the Kurds from the villages of Ziyoke, Sheekhan, and Akmala. Belmand: As per the 1957 census its population was 91. This village was also exposed as its sister villages of Nahla to being burned down, demolished, looted, plundered and chased out for several times since 1961 till 1987 when it was completely demolished and its inhabitants of about 40 families were taken to the coerced residential community in Aqra. Today there are 100 families, 50 of them went to the village following the March 1991 uprising and the rest live in different areas in Iraq while few are in Diaspora. There are trespasses on the village's lands and a young man Zaia Yonadam Zaia was martyred in an attack by Kurds on the headquarters of the Assyrian Democratic Movement in Arbil in 1994 and another one of its sons the hero Edwar Khoshaba who had killed two thieves when they tried to kill him and steal his sheep while in pasture. He had surrendered himself to the Kurdish authorities; later he was taken out of the Dohuk prison and delivered into the hands of the two thieves' relatives with the collaboration of the Kurdish authorities to be killed in a barbaric manner in 1995 in the village of Bagerman. Cham Rabatke: The village was exposed to the same problems like the other villages after 1961 and its population would leave and return back depending on the situation until 1987 when its population of 30 families were forced to leave and live in the coerced residential communities in Aqra which they had to build themselves, and while the building was in process they had to live outdoors in tents and get water from water tankers. Today there are more than 60 families, 25 of them had returned to the village following the March 1991 uprising and the rest live in scattered areas of Iraq while few families live in Diaspora. There are many trespasses on the village's agricultural lands by the Zibari Kurds since 1991 supported by the Barzani government in appropriating the Assyrian lands. Meruke: According to the 1957 census its population stood at 69 and there were about 15 families who had to finally leave in 1987 to live in the coerced residential community in Aqra. Meruke was also subject to plundering, looting and forced migration after 1961. Today there are about 30 families, 12 of them live in the village and they had returned after 1991 but the rest live in different regions in Iraq. Hazar Jot: As per the 1957 census the population was 178. Before 1961 there were more than 25 families living in the village when it was exposed to burning, looting, plundering and violating at the hands of the Zibari Kurds, but its population didn't leave it even with the that tragedy which was repeated again in 1972 and that's when its people left but they returned again in 1975 and remained. The village's lands are shared between its Assyrian residents and the Korani Kurds who are considered amongst the original inhabitants. The Kurdish half of the village belongs to Mohammad Salim Shoshi but there are also increased trespasses on both halves of the village's lands on the part of the Zibari Kurds since 1961 till now supported by the consecutive governments. Today there are 50 families, but only 15 of them live in the village while the rest are scattered in different regions of Iraq. Armash: According to the 1957 census its population was 204, and they are Assyrians of the Tkhoma tribe who went into Roman Catholicism. In 1961 the village was subjected several times to destruction, plundering and burning until 1987 when it was demolished by the Iraqi authorities within a plan to settle them in a coerced community in Atrosh. At present it has more than 70 families, 40 of them live in the village and they had returned after March 1991, and there are 13 families in Diaspora while the rest live in different parts of Iraq. Armash sacrificed two of its men Jameel Petto Goro and Dawood Shawel Yousif as a result of the repeated incidents. Azikh: In 1957 its population was 78, and just like its neighboring Armash it suffered the same fate after 1961 when its 20 houses were destroyed, burned down and looted while about 50 families were taken to live in the coerced Atrosh community when it was completely destroyed in 1987. At a later date about 20 families returned to live in the village while the rest are living in different areas of Iraq and Diaspora. Deze: Its Assyrian inhabitants left following the Simel (Simeleh) massacres so it became part of the properties of one Ibrahim Haj Mallo al -- Mazouri who settled more than 90 Assyrian families in 30 houses following their forced migration in 1974 from their village of Shwaden in the constituency of Zakho in order to work in the village and share the profits equally, this lasted until 1987 when the village was demolished and its population forced to move within the context of the plan to build residential communities. At present there are more than 200 families living in different regions of Iraq and only one family returned back to Deze because they were not convinced of the equal sharing of work, on the other hand 15 Kurdish families returned. Attosh: One of the ancient Assyrian villages with a population of 75 as per the 1957 census. In 1965 it was burned down, looted, plundered and its occupancy depended on the political circumstances. A small group of families remained in the village until 1988 when it was demolished by the Iraqi authorities in the infamous Anfal operations. Before 1961 there were about 25 families in the village and today that number is more than 50 families dispersed in different regions of Iraq. There are trespasses on the village by the Kurds but its inhabitants would like to go back if the trespasses are lifted. Cham Ashrat: It had a population of 95 as per the 1957 census, and it had 13 homes inhabited by 25 families before 1961, following this date it was the subject to burning, looting, and plundering at the hands of the mercenary Zibari Kurds belonging to the Iraqi authorities. Living at the village subsided after 1961 depending on the political circumstances until 1988 when the village was completely demolished in the infamous Anfal operations. Today it has more than 40 families living in different areas of Iraq and there are trespasses on its agricultural lands but its inhabitants are ready to return as soon as the trespasses are lifted. Malla Barwan: Trespasses on the village's lands by the Kurds. Tellan: In 1991, 30 families went back even though there are trespasses on its agricultural lands. Cham Chale: Had a population of 51 as per the 1957 census; its inhabitants didn't return after 1961 when the Kurds completely appropriated the village. Sawora: The Kurds appropriated the village and its inhabitants didn't return after 1961. "Issen" Siyane: According to the 1957 census it had a population of 249. After 1961 its people didn't return because they were subjected to killings and fleeing then it was appropriated by the Kurds. Argen: As per the 1957 census it had a population of 79. Its people were subjected to fleeing, and killings then the Zibari Kurds forcibly controlled it after 1961. Tlanitha: Its inhabitants didn't return back after 1961 and the Zibari Kurds appropriated the village. Seeder: Its population was forced to leave since 1950 and the Zibari Kurds appropriated the village. Meze: It had a population of 179 in 1957 but the Zibari Kurds appropriated the village after 1961. Bedole: Its inhabitants didn't go back and the Kurds appropriated the village after 1961. Sharman: A shared village with the Kurds but the Assyrians left in 1961 and the Zibari Kurds appropriated the village. Gandaka: Its population didn't return after 1961 and the Zibari Kurds appropriated the village. Kherdes: After 1961 its population didn't go back and it was appropriated by the Zibari Kurds. Ras Al - Ain: After 1961 its inhabitants didn't go back and the Kurds appropriated the village. Khirpa: The Zibari Kurds appropriated the village and its inhabitants didn't go back after 1961. Nohawa: An Assyrian village which was kurdified after 1961 but there are still three Assyrian families living there. Birta: Its population didn't go back and the Zibari Kurds settled in the village after 1961. Kora Dere: Its inhabitants didn't return after 1961 and the Zibari Kurds appropriated the village. Dinarta: The district of Dinarta was shared with the Kurds then was totally kurdified after 1961. 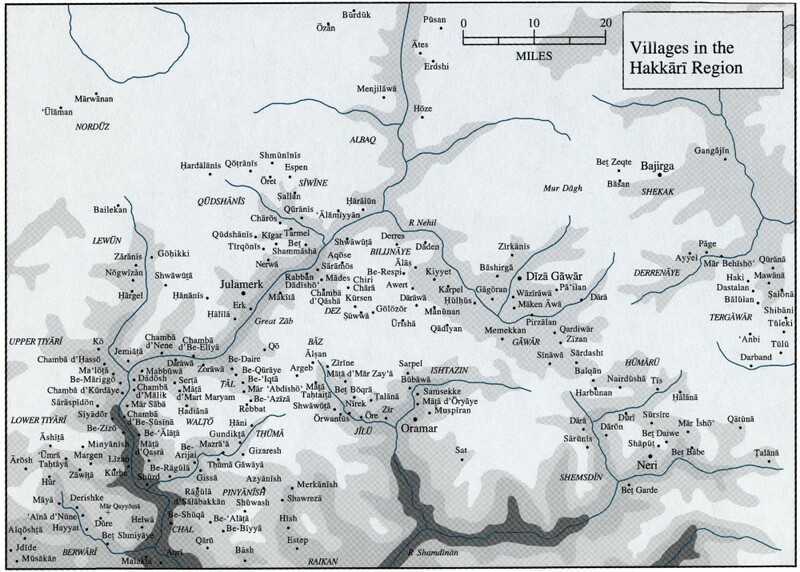 Shushan: A shared village with the Kurds but was completely kurdified after 1961. Khaleptha: An Assyrian village which was kurdified after 1961. Sifra Alsharqiya: An Assyrian village which was kurdified after 1961. Khirjawa: An Assyrian village which was kurdified after 1961. 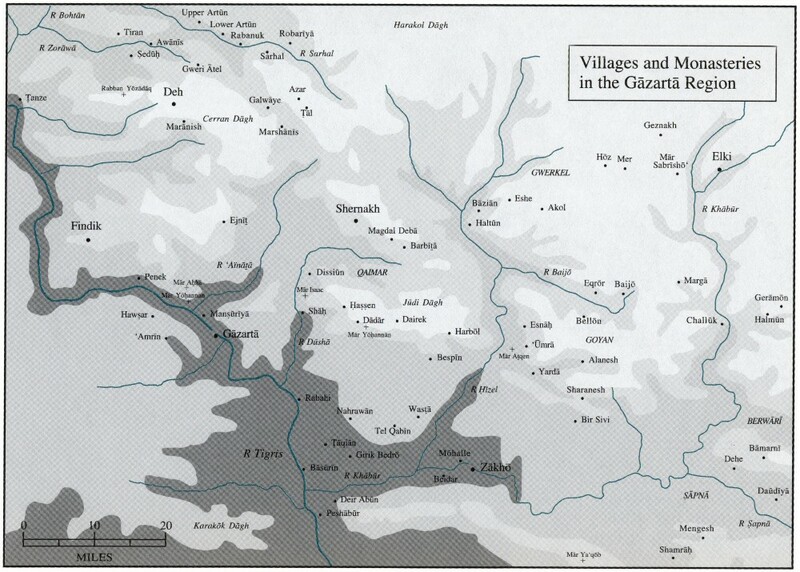 Gera Sor: An Assyrian village which was kurdified after 1961. Kane Qala: An Assyrian village which was kurdified after 1991. Korawa: An Assyrian village which was owned by the inhabitants of Belmand but the Kurds forcibly appropriated it in 1959 following the killing in the village of an Assyrian man Odisho Eyot because of a dispute about the ownership of the village and it was kurdified following that date. Bermawa: An Assyrian village appropriated by the Kurds after 1961. Zewka: An Assyrian village appropriated by the Kurds after 1961. Belembus: It was considered as the pasture for some villages in the Nahla valley and it was inhabited several times by the people who used to flee their villages when they were attacked every now and then by the Iraqi regime and its mercenaries. Dode Maseeh: It had a population of 73 as per the 1957 census and was kurdified after 1961. The city of Aqra: Aqra is an Assyrian word which means root or the base of a mountain. It's an ancient Assyrian village situated at the base of the mountain with captivating scenery. It was inhabited by Assyrians, Jews since long ago but the Kurds moved there in later times. Its original inhabitants were known for working in crafts such as jewelry making and weaving which are still practiced skillfully by some in Mosul and Baghdad. The Jews left in 1949 while the Assyrians began their exodus after 1961 as a result of the pressure against them by the Iraqi authorities and the Kurds putting them in a situation between a hammer and an anvil, causing it to be the main reason which pushed the people to leave permanently thus it was completely kurdified by the late 1960's. Aqra had a diocese which was closed because its population had left; nearby the village there are still remnants of the Mar Quryakos Monastery overlooking the Assyrian village of Birta which is located at 20 Kilometers from Aqra. Today, Aqra's families are scattered within Iraq and in Diaspora. Khalata: Its inhabitants left following the Simeleh (Simel) massacre in 1933 and the Kurds settled in it. Barcawra: Its population left following the Simeleh (Simel) 1933 massacre and they were from the Upper Tiari tribes and the Kurds settled in. Kerry: Its inhabitants were from the Upper Tiari tribes and they left it following the Simeleh (Simel) 1933 massacre and the Kurds settled in. Alolan: It's located an hour walking distance from the village of Cham Rabatke and it belongs to the Assyrians living there but they can't benefit from it because of the P.K.K. militias on its lands in addition to the attempts of the Kurds lately to claim its ownership and control it. Bellan: One of the ancient Assyrians villages situated near the villages of Birta and Tellan. The Kurds settled in following the Kurdish movement incidents in 1961. The city of Zakho: An Assyrian city and its Assyrian name means victory. It was inhabited by Assyrians since ancient times and later also by the Jews who were brought in by King Sennacherib following the disobedience of Jerusalem on the Assyrian Empire. The Jews lived peacefully in Zakho until they immigrated in 1949 to Israel under pressure from the Iraqi monarchy government. Slowly they were replaced with the Iraqi government's encouragement by the Kurds coming from Turkey belonging to the Kala and Sindy tribes while the Assyrian existence began to subside gradually as a result of the pressure exerted on them by the Kurds and the Iraqi government and the increase in the number of Kurds something which changed it as if it's a Kurdish city. There are still over a 1000 Assyrian families living in the metropolis of Zakho most of them are parishioners of the Roman Catholic denomination and few belong to the Syriac Church. There are also families who had migrated from the villages neighboring Zakho. Zakho is located at the Iraqi, Turkish, Syrian triangle and one of its landmarks is the Bridge of Dalale which the Arabs named the Abbasid Bridge, there is as well the Church of Mar Giwargis the Martyr which was founded in the 16th century A.D. and its old name was the Church of Zeitoun (olives) during the Nestorian times. It also has a Saint Mariam Church for the Syriac Catholic denomination which was founded 370 years ago. "Bersive" Bersawa: According to the 1957 census it had a population of 786. It was inhabited by some immigrant Assyrian families from Turkey more the seven centuries ago from the house of priest Mammo. It was considered one of the largest villages and was subject to different sorts of attacks by the Iraqi regime planes after 1961 when it had about 220 houses inhabited by more than 240 families. Today it has about 800 families, 60 of them live in the village while the rest are scattered in Iraq and Diaspora. Bersawa was constantly the subject of looting its agricultural produce by neighboring Kurds and in an attempt to prevent the thieves from returning, the Assyrian farmers used Islamic religious names for their properties such as (Takiya al Kaderiya) attributed to Sheikh Abd al Kader al Kilani but the trustees of the Takiya took advantage of the name in order to get a percentage of the profits which prompted the villagers to present a formal lawsuit in 1966 against this share of the profits which was 10% and they chose to represent them the lawyers Yousif al Haj Elias from Tal -- Afar and Najeeb from Mosul. Najeeb was able to win the case for the villagers but later became the subject of an assassination attempt at the hands of unknown. There was an appeal with an influence by the Kaderiya Sheikhs thus the judgment was reversed to the advantage of the trespassers, even though the equity decisions of 1956 and before confirm that the village's lands were delegated through legal deeds and the right of management was hereditary for centuries before. However, even with all the legal documents the Iraqi authorities issued a decree to compensate the villagers with money and the lands were considered as an endowment for Sheikh Kilani. In 1977 a residential community of 600 units was built by the Iraqi authorities whereby 40 units were given to Assyrians and the rest was given to Kurds who were brought from the border villages which were emptied of their inhabitants. The village's inhabitants were tremendously affected by this coerced community and in 1989 one of its citizens was assassinated at the hands of unknown but no procedures took place even with the continuous lawsuits by the villagers. Sharanish: As per the 1957 census its population was 384. Its inhabitants had left with Agha Potros during WWI and returned seven years later settling in the village once more till 1987 when it was destroyed by the Iraqi authorities. The village with its 80 homes was also subject after 1961 for looting, plundering, and burning at the hands of the Iraqi authorities and its collaborators the Zibari Kurds while its population was forced to flee. According to the 1978 census Sharanish had 160 families with a population of 2000, as for today the number of its families is about 400 families. Its inhabitants didn't go back because it's situated within areas where the P.K.K. militias exist, thus the village was bombed by Turkish planes in 1991 when some of the villagers had returned and three persons were killed. There are 80 families living in the village while the others are scattered in Iraq and Diaspora, in addition there are trespasses on the village's lands from the village of Sharanish Islam where some families live in military barracks which were founded by the Iraqi authorities on the village's lands. Sharanish was famous for its distinguished men such as Alphonse Mingana, the priest Hanna Khoshaba and Bishop Hanna al Kaldani. Yarda: According to the 1957 census its population was 280. Today there are P.K.K. militias on its lands. Alanish: Its population was 264 as per the 1957 census. Today there are P.K.K. militias on its lands. Sanat: As per the 1957 census its population was 585. Today there are P.K.K. militias on its lands. "Der Shish" Aumra: According to the 1957 census it had a population of 361 and it was kurdified after 1976. Bahnona: According to the 1957 census it had a population of 111. It was a shared village with the Jews who left in 1948 and the village was kurdified after 1961. Shwaden: As per the 1957 census it had a population of 121. Today there are P.K.K. militias on its lands. Istablan: A village shared with the Kurds, there were five Assyrian families but the village was completely kurdified after 1961. Levo: According to the 1957 census it had a population of 616. There were more than 350 families in the village living in 150 homes some were built of clay while the others were built of stone. The regime's planes bombed it after 1961 and it was looted, plundered and burned down several times as well. Every time its people would take refuge in the nearby hills to protect themselves and would return when the situation was calmer, thus they continued to leave and return depending on the political circumstances in the region until 1988 when the village was completely destroyed in the infamous Anfal operations and some of its citizens like Sabriya Maroge Sliwa, Amira Odisho Khosho, and Jibrael Odisho Khosho were killed and another Saber Khayri Youkhana disappeared. Today Levo has more than 1000 families but only 40 families live in the village and they had returned after 1991 while the rest live in different regions of Iraq and a substantial number in Diaspora. There are trespasses on the village's lands by the Kurds but there weren't any procedures put in place by the Kurdish authorities even though the villagers presented several appeals. Naf Kendala: It had a population of 240 a per the 1957 census, with more than 150 families living in 60 houses before 1961 when it was exposed to the same fate as neighboring Levo. Today it has more than 250 families scattered in all regions of Iraq and only a small number returned to the village because of the many trespasses on the village's agricultural lands. Perka: Its population was 108 as per the 1957 census, and before 1977 it was inhabited by about 90 families living in 30 homes but when the inhabitants of the border village Birbilla were brought and settled in, its original inhabitants had to leave because of troubles against them by the new comers. In 1978 its inhabitants had to leave when a group of the Iraqi Communist Party set fire to the village following the killing of two of its members, thus the village was abandoned until 1991 when the Kurds of the Kharabeeke village trespassed on its lands to exploit them. When the trespassers left to their villages they gave Perka back to its Assyrian owners to cultivate and share it equally under claims that (the trespassing Kurds are the owners) therefore the Assyrians aren't encouraged to go back and re-build the village. Mala Arab: According to the 1957 census it had a population of 237. Several Assyrian families inhabited the village in 1922 and they stayed there for two years then another group of Assyrians who came from Merga settled in until the village was burned down for the first time in 1963 at the hands of the Zibari Kurds the collaborators of the Iraqi authorities and its population of about 120 families who were living in 50 homes had to leave as a result of these actions. In 1970 its population returned following the March 11 declaration and they rebuilt the village once more until it was the year 1988 when Mala Arab was once more destroyed. Today its families are estimated at about 250 living in different parts of Iraq and Diaspora. The Kurds took advantage with the village being empty to trespass on its lands which prompted the villagers at the time to demand Barzani (the father) to look into the matter but he didn't do any thing about it, meanwhile Barzani had convinced the inhabitants that he had issued orders to evacuate the village but the administrators in Zakho didn't respond, thus the matter remained un solved until 1989 when agricultural deeds were struck between the department of agriculture and the trespassing Kurdish families, then those deeds were forced upon the inhabitants. Problems also occurred between the villagers and the Kurds which had lead to the killing of Toma Goro at the hands of unknown as usual. Later on in 1992 few families had returned but they had to flee following the killing of two villagers and two Kurds without any procedures being taken against the trespassers. Thus the village remained empty from its Assyrian residents and that's how it was kurdified and prepared for the Kurds to settle following an imbalanced struggle between the two groups. Merga Sor: It had a population of 186 in 1957. The village had 80 homes inhabited by about 170 families and they never left even with all the events that took place until 1988 when the village was demolished by the Iraqi authorities and today the number of families is about 250, 5 of these families live in the village and they had returned after the March 1991 uprising while the others live in different areas of Iraq and Diaspora. In addition to that the village's roads are still not paved, every day services are not available and during rainy days it's difficult to reach the village. Bedaro: As per the 1957 census it had a population of 508. In 1963 it was the first time when its population of 868 living in 95 homes had to flee the village to Zakho then they returned in 1965 but they were once again forced to flee in 1969 when the village was heavily bombed. Following the March 11, 1970 declaration its residents went back and they built 30 houses to settle until 1974 when they had to flee again after the collapse of the agreement between the Iraqi regime and the Kurdish movement, then in 1975 the residents went back once more for few months before they were moved out for the last time during the Arabization phase in 1976. At present its families are about 400, 20 of them live in Zakho and 50 in Diaspora while the rest are scattered in Iraq. The Reverend Polus Bedari was known for being a man of literature and a linguist he was also a member of the Kurdish movement, and today his village is the scene of many trespasses by the Kurds on its agricultural and residential lands and that's the main reason preventing its original inhabitants from going back even though they presented many appeals to the Kurdish authorities in relation to these matters. Qara Wola: It had a population of 334 as per the 1957 census, after 1961 the village was subject to looting, burning, plundering and its people were chased out. They had returned after 1970 and remained in the village until, 1975 when the Iraqi authorities moved them out as part of their plans to Arabize the area. Before forcibly evacuating the village it had 70 homes with more than 100 families, and today there are more than 200 families, 10 of them live in the village because they had returned after 1991 and 25 families live in Diaspora while the rest live in different regions of Iraq. There are gross trespasses by the Kurds and one of them is claiming the ownership of the village without any legal documents upsetting in the process the Assyrian inhabitants. Qara Wola lost many of its sons and daughters beginning in 1961 when the deacons Eliya and Behnam Qallo were killed at the hands of Zubair Mahmoud's men, the mercenaries of the Iraqi authorities when the village was burned down. Then again the village sacrificed 33 of its men, women, children and the village's priest Hanna who were martyred when they were killed in a treacherous manner by the Iraqi authorities at the hands of the executioner Lieutenant Abd al- Karim al-Juhaishi in the Soriya village massacre in 1969 when that village was also completely annihilated. Feshkhabor: According to the 1957 census it had a population of 899. It witnessed the passage of Mallik Yaqo and his group of the Tigris River to Syria during the 1933 uprising. It had 175 homes and 150 families were living in the village because the rest had left following the events which happened in the North of Iraq in 1961.In 1963 the Syrian army entered the village and the Kurdish mercenaries supporters of the Iraqi authorities burned down the village lead by Farhat Haji Agha al Kurdi (a resident of Zakho from the Sindy Kurdish tribe). In 1974 and as a result of the renewed fights between the Iraqi authorities and the Kurds, its inhabitants left to Syria via the Tigris River and remained there for six months and later the village was rebuilt again. However, in 1976 the village was evacuated and its people forced to leave because of its location at the Turkish -- Syrian border but Arabs were re-settled in their place while its original inhabitants scattered all over Iraq and Diaspora. Later on Mirani Kurds and Mousa Rash settled in the village and those were brought after the March 1991 uprising by Fadel Mirani the K.D.P. member of the political bureau with the help of the Kurdish government when many Arabs had fled and its original owners were not given the chance to return for its vital and strategic location. Moreover, the department of agriculture distributed many of the village's lands to the families of the Barzani martyrs, while its original inhabitants are still waiting for the Kurds to be driven out so that they may be able to go back to their village to live in peace, freedom and tranquility. Some of Feshkhabor's known personalities were Aziz Agha the village's chief, Karim Yaqo, Mansour Potros, Giwargis Potros, Betta Osa, Toma Guiliana, Kella Azar, Eshoo Younan, and Reverend Yousif Shaleeta, it also has a monumental Mar Oraha Monastery as well as the Mar Giwargis Monastery and the Saint Mary Church. Derabon: According to the 1957 census it had a population of 657. In 1976 the village was arabized and in 1991 it was kurdified with the help of the Kurdish government. The village witnessed the same oppressions like its neighboring Feshkhabor which is only few kilometers away. Lately a western Christian organization had begun the building process of 30 residential units 20 of them for Assyrian residents and 10 for trespassing Kurds whose number exceeds 100 families and they had settled in the village when the Arabs fled in 1991. The Kurdish government is encouraging this project in an attempt to gain European and Christian public opinion as well as to throw dust in the eyes and realize their separatist goals by pretending to re-build the Christian villages in the area. Soriya: According to the 1957 census it had a population of 102. It was kurdified after 1969 then it was Arabized in 1976 and kurdified once more after 1991 with the support of the Kurdish government. Soriya is located on the banks of the River Tigris and in administrative matters follows the district of Al Assi (today's Bateel). The village witnessed on 16/09/1969 the massacre which carries the village's name was executed at the hands of Lieutenant Abd al Karim al Juhaishi from Mosul when a mine blew up under a military car four kilometers away from the village. The result was the killing of 38 people and wounding 22. The massacre's victims: The information is taken from the Human Rights Centre -- Salah Zerro / "Dohuk" Nohadraa. - The family of Khamo Maarogeh Shimun (the village's mayor): Khamo Marogeh, his wife Kathryn Sargis, and Laila Khamo. - The family of Mansour Ishaq: His wife Kathryn Shimun, and a three months old baby. - The family of Misso Maarogeh Shimun: Misso Marogeh. - The family of Hermiz Marogeh Shimun: Goro Hermiz, Antar Hermiz (a little boy 5 years old). - The family of Othman Suleiman: His wife Amina Rajab, Nahida Othman, Sabiha Othman, and a little baby three months old. - The family of Meho Hassan: Miran Meho, Ghariba Meho. - The family of Berro Huusein: His wife Qamar Rasheed, Nadira Berro, and his mother Halima. - The family of Mounir Yousif: Firman Mounir, Talan Mounir. - The family of Eilo Youkhana: Yaqo Eilo. - The family of Yalda Raasho: Basima Yalda. - The family of Giwargis Qoryakus: Naji Giwargis. - The family of Shabo Baazna: His wife Shoneh, Samir Shawel and a little girl who died in hospital. - The family of Boutros Toma: His wife Yono Sliwa, a little girl 5 years old, and a little boy 4 years old. - The family of Alo Youssif: His wife Shirin Samo, and Amina Alo 7 years old. - The family of Oraha Khamo: Oraha Khamo, Warina Oraha 5 years old. - The family of Rasho Warda: Rasho Warda, and his wife Asmar Elias. - The Reverend Hanna. - The driver Husni from Zakho. Bajid Barave: According to the 1957 census it had a population of 199. It was arabized in 1976 and then kurdified in 1991 with the support of the Kurdish government. Bakhloja: It had a population of 209 as per the 1957 census. It was arabized in 1976 and its inhabitants didn't go back, moreover about 200 of its lands were submerged by water from the Mosul Dam. Parkh: According to the 1957 census it had a population of 139. It was completely kurdified after 1961. Dar Hozan: As per the 1957 census it had a population of 244. It was completely kurdified after 1961. Khelekh: As per the 1957 census it had a population of one hundred and twenty three. Mezry Khabor: It was kurdified after 1961. Tosana: It was kurdified after 1991. Mashara: The Kurdish trespassers have been exploiting its lands since 1991. Bensora: As per the 1957 census it had a population of 149. Afzorik Shnno: The village had about 60 families before 1975 when the Iraqi authorities began the Arabization process forcing its inhabitants to flee. The village was looted, plundered and burned down four times between 1961 and 1970. Today it has more than 200 families 25 of them live in the village, 30 families are in Diaspora and the rest live in different parts of Iraq. Afzorik Mear: According to the 1957 census it had a population of 176. Deshta Takh: It was inhabited by four families of the Sanat village but they were forced to move out in 1976. Its inhabitants didn't go back because of the P.K.K. militias in the area. Bajowa: It had a population of 79 as per the 1957 census. It was inhabited by five families from the Yarda village but they were moved out in 1976 by the Iraqi authorities and they didn't go back because of the P.K.K. militias in the area. Harkonda: This village is located on the River Khabor in the Alsindi area. It was inhabited by Assyrian families who had to leave following the Simeleh 1933 massacre and they gathered in the Gondkosa village to defend themselves of probable Kurdish attacks. The Kurds settled in it after the above mentioned date. Spendarook: It is located on the River Khabor in the Alsindi area, it was also inhabited by Assyrian families who had to leave after the Simeleh 1933 massacre and they gathered in the Gondkosa village to defend themselves against probable Kurdish attacks. The Kurds settled in the village following the above mentioned date. The Marga Region: It was divided into two parts in 1924 when the Iraq and Turkey specified the borders. The Kurds appropriated the part which fell in Turkey because its inhabitants chose Iraq as their country and that is the smallest part of their lands. Marga is composed of seven villages and they were able to benefit from their agricultural lands until mid 1970's when the P.K.K. militias took over the lands. Sumeile (Simeleh or Simel): It is one of the ancient Assyrian villages with deep roots in Christianity whereby there are ancient documents belonging to the Church of Simeleh which were found in neighboring Sheyos and are still preserved in the Chaldean Patriarchate library. Sumeile was emptied of its people during WWI but then a group of Assyrians coming from the Hakkari region settled in until 1933 when they were subjected to ugly massacres at the hands of the Iraqi armed forces lead by Bakir Sidqi al Kurdi with the help of some Arab and Kurdish tribes when they declared the Jihad "holy war" against the Christian "infidels" thus more than 4000 women, men and children fell victims when they were promised safety if they were to lay down their weapons but treachery, deception and betrayal were waiting for them to witness the first massacre in the modern history of Iraq. The Kurds settled in when the village was emptied of its inhabitants and today there are about 250 Assyrian families living in Sumeile and they had moved from neighboring villages (Sheyos, Badalliya, Feshkhabor, Mawana, and Bakhitmey) because of the events which took place in the area during the past years. Simeleh is considered one of the important constituencies of the Dohuk governorate and is located on the international road connecting Iraq to Turkey. The number of Kurdish settlers in the area is more than double. Bakhitmey: According to the 1957 census it had a population of 232. It was inhabited by Assyrian families who had to leave to Syria following the Sumeile 1933 massacres thus the village was owned by Arab bourgeoisie. In 1956, 80 Assyrian families bought back the village and it was registered in 1957 under the names of Mallik Kheyou, Zadoq Enwiya, Enwiya Hawel along with 73 Assyrian families until they were forced by the Iraqi authorities to move out in 1978 under the pretence that the village was near the military Fayda camp when parts of the village's lands fell within the camp. Few of its people returned after the 1991 uprising. Today it has more than 300 families living in different regions of Iraq and Diaspora. Mallik Kheyou is one of the village's sons who worked hard and is accredited with buying the Bakhitmey and settling his people in it. Sorka: As per the 1957 census it had a population of 196. Mawana: As per the 1957 census it had a population of 61. The villagers were forced to leave because of the fowl project which was established on the lands of Badalliya and the rest of its lands were distributed after 1991 to Kurdish peasants and few Assyrians. Its lands are not suitable for residence because of the fowl project. Badalliya: According to the 1957 census it had a population of 234. It is part of the Simeleh constituency and was inhabited by Assyrians from the Baz tribe who left in 1933 as a result of the Simeleh massacres then the village was owned by Mahmoud Beg an Arab bourgeois. Then the village was bought from him in 1953 and 60 Assyrian families lived in it, in addition to one Kurdish and two Arab families. In 1987 the Iraqi authorities established a fowl company on the lands of the village (Udai had shares in it later on) considering them as public and not private lands (The villagers didn't have a chance to complete the official registration documents). The inhabitants then were forced to move out without any compensation. Today there are more than 150 families most of them live in Simeleh and different regions of Iraq and Diaspora. In 1991 the rest of the village's agricultural lands were distributed to the peasants but in an unfair manner thus most of the lands were given to the Kurds and very few for the Assyrians. Bishop Mar Narsai of the Ancient Church of The East in Kirkuk was one of Badalliya's known personalities. Kera Gora: It had a population of 201 according to the 1957 census. It was inhabited by the Assyrian families who had left to Syria following the Simeleh massacres then it was inhabited by some other Assyrian families until 1987 when they were forced to move out because of the fowl project which was established on the lands of Badalliya. Kolpen: According to the 1957 census it had a population of 197. Kani Sipy: It had a population of 156 according to the 1957 census. Hegerkey: As per the 1957 census it had a population of 41. "Sige" Sheyos: According to the 1957 census it had a population of 417. Its inhabitants were forced to move to the Al-Mansouriya residential community. After 1991 about 15 families returned to live in the village. Hawrisk: It is a shared village with an Armenian majority and some Assyrian families. As per the 1957 census it had a population of 238 and was known as the village of Leon Pasha al --Armani who had accompanied the leader Agha Potros in his fights against the Turks in WWI. This village was completely kurdified after 1991. Ishkavdil: It was completely kurdified after 1961. Derjendy: It had a population of 142 as per the 1957 census and was inhabited by the Assyrian families who were forced to go to Syria as a result of the Simeleh 1933 massacres. Later it was inhabited by some other Assyrian families when the new wave of forced migration began after 1961 until it was arabized in 1975. Kharap Kolik: It was kurdified after 1961. Bajid Kindal: As per the 1957 census it had a population of 127. The village was arabized in 1976 and then kurdified in 1991. Bosiryan: It had a population of 133 as per the 1957 census and it was kurdified after 1991. The village of the Mar Yaqo Monastery: It's located on the mountain called Bikher(an Assyrian word meaning the place of the free). It's an ancient Assyrian village with the Rabban Yaqo Monastery (Jacob the Monk) as well as indications of the Monks who had lived in the mountain which the Kurds call (Qasha Fir). In the early 1920's the Dominicans established an academy which consisted of three floors and 360 rooms and many of our people graduated of this educational and religious school. However, in the early 1960's the village was bombed several times so its inhabitants had to leave and whatever was left of the Monastery and school was destroyed in the infamous Anfal operations of 1988, thus its people never returned back and the Kurds are benefiting today of its lands. One of this villages known people is Abou Younan (the owner of the Abou Younan Hamburger restaurants in Baghdad). (Abou is a word used by the Arabs to mean the father of). Mangesh: It was the centre for the Mangesh district in 1920 but before that it was connected to the district of Al-Dawoudiya which was connected in turn to the region of Amediya then it became the centre for the Al-Douski villages which in turn were connected to Dohuk which became a governorate in 1969. The village had 230 homes with Mar Giwargis Church (St. George) in its midst before it became a district centre. According to the 1947 census it had a population of 1195 however this number was reduced to 959 in 1965 which is a significant decrease caused by the migration to the cities following the 1961 events. In 1970 its population increased to 1390 when the neighboring Kurds left their villages and came to settle in Mangesh thus they became today the" home owners" when they were just immigrants and they don't want to go back to their villages even though they do benefit from their agricultural lands in addition to their trespassing on the lands of Mangesh and they also live in the homes of the original owners with support from the Kurdish government and some of the village's inhabitants and profiteers who have kurdified themselves. The village's inhabitants are suffering from oppression and injustice at the hands of the Kurds to force them into leaving whatever they have left of lands and homes so that it may be completely kurdified. Mangesh is considered one of the ancient Assyrian villages where many ancient sculptures were found dating back to the era of Halaf and Eridu (4000 -- 4500 B.C.) In the south part of the village there are traces of the Mar Mari Monastery and it's most probable that Mar Qardakh the Martyr was baptized in that Monastery at the hands of Mar Odisho. It's also possible that Christianity was introduced to the village in the early first century A.D. Mangesh was exposed during its history to greedy invaders' raids, calamities and epidemics. This village didn't witness any tranquility neither in its ancient nor its present times whereby its inhabitants were subjected to assassinations since the early 1950's thus the number of those assassinated exceeds 40 and all at the hands of unknowns. One of the prominent figures was Rayis Hanna the village's mayor who was assassinated by the Kurds in the late 1950's for defending the village's interests and forbidding the Kurds from trespassing on its lands. Another prominent figure was the engineer Francis Yousif Shabo who was a member of the Assyrian Democratic Movement and a member of the Kurdish parliament who was also assassinated in 1993 for his national viewpoints, his attempts to remove the trespasses and reclaim the kurdified villages. Another figure Lazar Mikho (Abou Naseer) of the Iraqi Communist Party was also assassinated fifteen days apart from the Shabo assassination and the killers are known but no procedures were taken against them. The assassination series ended in 1997 with the killing of six young men from the village but the murder was registered against unknowns in the P.K.K. Today there are 250 families living in Mangesh but more than the double of that number live in different regions in Iraq and many more in Diaspora. However, the number of trespassing Kurds is much larger than that of the original inhabitants. One of the village's known figures is the commander of the fourth army regiment Said Hamo Qallo whose father became a Muslim after committing a murder in the village then taking refuge in Tal-Afar and he is the first cousin of the late Bishop Hanna Qallo. Gond Kosa: As per the 1957 census its population was 136. It's an Assyrian village on the Khabor River annexed to the district of Mangesh. It was inhabited by 170 families in 1973 during the uprising of Mallik Yaqo and the bloody Simeleh (Simel) massacre when Gond Kosa was besieged for three consecutive days by the Duski Kurdish tribes in order to loot, burn down the village and kill its inhabitants just like in many other villages during that period of time. However, the village's men were determined to resist and fight till the end, something which prevented the Kurds from attacking the village, and few Kurdish families like Haji Khaled from the neighboring Akmala village supported the Assyrian villagers of Gond Kosa. Migration began after 1961 following the events which occurred in the region until 1988 during the infamous Anfal operations when the village was demolished and burned down by the Iraqi authorities and the Zibari Kurds; 34 individuals of the village (men, women and children) were arrested and they're still missing without a trace until this day, amongst them Gond Kosa's mayor Toma Bakus with all the members of his family. Many of its dignitaries were assassinated in treachery and of its famous men were the priest Zaia Bobo Dobato who became the pastor of The Church of The East in the early 1950's in the governorate of Nineveh and environs until he fled from the regime's violence in 1985 to the quarters of the Assyrian Democratic Movement and then to Iran where he passed away in late 1989. He had participated in several international and regional conferences exposing Saddam's regime as well as its practices against our Assyrian and the Iraqi people. In 1991 about 30 families returned to the village out of 300 or more who still live in different regions of Iraq and Diaspora. Gond Kosa is still without electricity or paved roads just like most of our Assyrian villages which are neglected and persecuted by every one, while the Kurdish villages enjoy all the advantages and services. In addition to all this there are countless trespasses since 1991 on the village's agricultural lands by neighboring Kurds who are supported by the Kurdish government while the Assyrian villages don't find any one to listen to their continuous complaints of persecution. Majel Makhte: The remainder of its inhabitants left to Syria following the Simeleh (Simel) 1933 massacre and the Kurds settled in after the above mentioned date. Dair Kishnik: The remainder of its population left to Syria following the Simeleh (Simel) 1933 massacre and the Kurds settled in after the mentioned date. Dairke: The remainder of its inhabitants left to Syria following the Simeleh (Simel) 1933 massacre and the Kurds settled in after the mentioned date. Karpel: Its population left and never returned back after the Simeleh (Simel) 1933 massacre while the Kurds settled in after the mentioned date. Ala Keena: An Assyrian name meaning (the truthful god) its population left it following the Simeleh (Simel) 1933 massacre and the rest went to Syria while the Kurds settled in after the mentioned date. Chem Kare: It's located within the borders of Gond Kosa it was inhabited by Odisho Lawando who moved to Gond Kosa in 1933 fearing Kurdish attacks, thus one Haji Sarhan appropriated the village after 1961 and he had arrived from the Shikhoh Fortress in Barwari Bala and he still exploits its lands until today. Gond Naze: It's located with the borders of Gond Kosa, its inhabitants moved to Gond Kosa in 1933 for fears of Kurdish attacks and the Assyrians of Gond Kosa still benefit of its lands. Korekavana: This village was inhabited by about 250 Assyrian families in 95 homes before the 1933 uprising which was lead by Mallik Yaqo, thus most of the population joined their leader and left to Syria while the few who didn't participate with Mallik Yaqo remained in the village. After 1961 Korekavana was continuously persecuted at the hands of the Iraqi authorities and its Kurdish supporters which forced the inhabitants to leave but they returned again once the situation was relatively calm. There are numerous trespasses on the village's lands whereby the Iraqi government had established in 1976 a residential compound of 600 homes to settle the Kurds who had been forced out of their villages and who in turn trespassed on the village's lands. After 1991 the inhabitants of the Zawita village trespassed also on Korekavana's lands. Baroshkey: It's the village of Assyrian chief Mallik Yaqo who left it following the 1933 uprising and entered Syria along with his people, thus the lands were invested by the neighboring Assyrians of Korekavana. After 1991 the Kurds of Zawita appropriated this village and began to forcibly exploit it supported by the Kurdish government. Bagerey: Its inhabitants who had participated in the 1933 uprising fled to Syria and the Kurdish Aghas appropriated the village and had a contract in 1953 with some Assyrian families to share it 50/50. This village wasn't subjected to looting, plundering or burning and today 25 families out of 60 live in 18 homes in the village while the rest live in different regions of Iraq and ofcourse there aren't any trespasses on this village. Babblo: As per the 1957 census it had a population of 111, with 25 Assyrian families living in 16 homes built before 1961 when after this date the village was looted, burned down and plundered three times the last of which was in 1988 during the infamous Anfal operations. Today, Babblo has about 60 families, 17 of them invest the agricultural lands but they return to "Dohuk" Nohadra where they live and only three families live in the village. There is some trespassing on the village's lands on the part of Kurds. Some of Babblo's known personalities were: Rabbi (teacher) Ishmael, the priest Shmoel and reverend Estephan, who built the schools to teach the mother tongue and religion. The village also has remnants of an ancient church of Mar Yousif (St. Joseph) in addition to the monks' cells. Babblo also lost one of its heroic sons, Sheeba Hameh who was martyred in 1983 in the Hesherke village in an inadequate battle with the Iraqi regime and its Kurdish mercenaries (he had committed suicide in order not to be taken captive by the enemy following the martyrdom of his friend the hero Sankho). He is considered one of the first martyrs of the Assyrian Democratic Movement. Bash: According to the 1957 census it had a population of 150. It's located near the Turkish border in a narrow passage named after it Kali Bash. It was inhabited by Assyrian tribes since ancient times where it had 36 homes and more than 60 families in 1961 when forced migration began as a result of the events which took place then. In 1977 the village was demolished and its residents moved out to implement the emptying of border villages' policy. In 1981, 20 families returned back with the beginning of the Iraq -- Iran war even though the Iraqi authorities had declared the area a prohibited zone. These people remained in the village until 1988 when they all fled to Turkey, and when the Iraqi authorities issued a pardon some of the families returned and gave themselves up to the Iraqi authorities but they went missing and their fate is unknown until today. The village has more than 110 families, most of them live in different areas of Iraq but they didn't return because of the P.K.K. militias in the region and 26 families live in Diaspora. Weela: It's considered to be one of the small and ancient Assyrian villages, with the village of Bash located to its north. According to the 1957 census it had a population of 59 with 16 families living in 9 homes in 1961. The residents were forced to leave in 1977 because their village was included in the plot of emptying the border villages and they never went back because of the P.K.K. militias. Today there are about 40 families, they all live in different parts of Iraq and none of them is in Diaspora. Lower Nirwa: It is located on the Turkish border, and as per the 1957 census it had a population of 149. The number of its families was estimated at about 32 living in 25 homes until 1961. In 1977 the Iraqi authorities forced the villagers to move out because the village was included in the emptying of the border villages plot. Today it has about 70 families living in different areas of Iraq and they didn't go back because of the P.K.K. militias in the area. However, no one lives in Diaspora. Karo: An Assyrian village which was inhabited since ancient times and it has the remnants of an old Monastery named after Mar Zakka. It had 42 families living in 18 homes in 1961 when they began to gradually leave until 1977 when the villagers were forced to move out and the villages was completely burned down by the Iraqi authorities as part of their emptying the border villagers plot. In 1981 few families returned back during the Iraq -- Iran war where they stayed until 1988 when it was demolished yet again during the infamous Anfal operations and its population never returned back because of the P.K.K. militias in the area. One of its known personalities is the priest Pilipos the pastor of the "Dohuk" Nohadra diocese of The Church of The East, who lives in Nohadra at present. Heash: It is considered one of the largest villages of the area with a population of 286 according to the 1957 census. It had 80 families living in 22 homes in 1961 when they began to gradually leave as a result of the events in the area. Its population left after 1961 because Barzani was against the Kurdish Agha of Rekan but the villagers were in agreement with the latter thus they had to leave their village and they never returned especially with the presence of the P.K.K. militias in the area. Today there are about 250 families living in different regions of Iraq and 35 of them live in Diaspora. Istip: It is located in the Rekan area bordering Turkey. In 1961 it had 47 families living in 24 homes but they had to leave because they were in agreement with the Kurdish Agha of Rekan and not with Barzani. Most of them went on to live in Telkef as well as Mosul and from there they began to spread to different areas, hence today there are about 150 families, 44 of them live in Diaspora and the rest in different regions of Iraq. They never went back to their village because of the P.K.K. militias in the region. Medan: As per the 1957 census it had a population of 31, with 09 families living in 04 homes until 1961 when they were forced to leave because of their position vis a vis the Kurdish Agha of Rekan who opposed Barzani. Thus the villagers left to Telkef and Mosul spreading afterwards to different regions of Iraq. Today there are about 40 families, 04 of them live in Diaspora and the rest never went back to their village because of the P.K.K. militias in the region. Derikne: According to the 1957 census it had a population of 130. It is located in the Banhil area in the middle of the Mateen Mountain, on the road to Sapna, Nirwa and Rekan. It's one of the ancient Assyrian villages famous for its pottery and some of its inhabitants still practice this craft until this day. This village was not part of the plot to empty the border villages whereby 30 families lived in it until 1988 when the village was demolished during the infamous Anfal operations and it lost a lot of its sons and daughters as a result of this. It's been known that this village was subject to invasions as well as voluntary migrations for different reasons some of which were the increase in its population when at one point it had more than 550 families with seven Churches and Monasteries when ceremonies were held at the same time in all the locations at the same time. Other migrations were work related thus some families were identified in Ankawa, Shaqlawa and other parts of Iraq who had migrated to work in pottery making. Its residents used to exchange commodities with the other Assyrian villages of Tiari, Hakkari and the rest of the villages in the area. Its more than 250 families never returned to the village because of the P.K.K. militias in the region and they are dispersed in the different regions of Iraq. The names of a part of the Assyrian villages which were kurdified following the Sumeile or Simeleh massacre of 1933. These villages were not mentioned in the search but the information was taken from the internet. Kowashey: The Simeleh constituency, it was inhabited by the Upper Tiari tribe. Chem Jehaney: Annexed to the Simeleh constituency and was inhabited by the Tkhoma and Upper Tiari tribes. Garvaly: Annexed to the Simeleh constituency and was inhabited by the Tkhoma and Upper Tiari tribes. Sar Shorey: Annexed to the Simeleh constituency and was inhabited by the Tkhoma and Upper Tiari tribes. Kaserezden: Annexed to the Simeleh constituency and was inhabited by the Baz tribe. Lazga: Annexed to the Simeleh constituency. Rabibyia: Annexed to the Simeleh constituency. Tal Zet: Annexed to the Simeleh constituency and was inhabited by the Upper Tiari and Tkhoma tribes. Betershy: Annexed to the Simeleh constituency and was inhabited by the Upper Tiari and Tkhoma tribes. Zeniyat: Annexed to the Simeleh constituency and was inhabited by the Baz tribe. "Said Thaher" Sezary: Annexed to the Simeleh constituency and was inhabited by different Assyrian tribes. Mansuriya: Annexed to the Simeleh constituency and was inhabited by different Assyrian tribes. Idleb: Annexed to the Simeleh constituency and was inhabited by different Assyrian tribes. Aloka: Annexed to the Simeleh constituency and was inhabited by the Saranayeh communities. Kitba: Annexed to the Simeleh constituency and was inhabited by different Assyrian tribes. Gereban: Annexed to the constituency of "Dohuk" Nohadra and was inhabited by the Mar Bisho communities. Rekawa: Annexed to the constituency of "Dohuk" Nohadra and was inhabited by the Mar Bisho communities. Biswaya: Annexed to the constituency of "Dohuk" Nohadra and was inhabited by the Mar Bisho communities. Shekhidra: Annexed to the constituency of "Dohuk" Nohadra and was inhabited by the Mar Bisho communities. Kharsheniya: Annexed to the constituency of "Dohuk" Nohadra and was inhabited by the Jilo tribe and Mar Bisho communities. Telkhish: Annexed to the constituency of "Dohuk" Nohadra and was inhabited by the Gawar and Mar Bisho communities. Aloka: Annexed to the Atrosh area of the Sheekhan constituency and was inhabited by the Upper Tiari tribes. Begahi: Annexed to the Atrosh area of the Sheekhan constituency and was inhabited by the Upper Tiari tribes. Betafrey: Annexed to the Atrosh area and was inhabited by the Upper Tiari tribes. Baderden: Annexed to the Atrosh area of the Sheekhan constituency and was inhabited by the Upper Tiari tribes. Benaringee: Annexed to the Atrosh area of the Sheekhan constituency and was inhabited by the Upper Tiari tribes. Kaberto: Annexed to the Fayda area of the "Dohuk" Nohadra constituency and was inhabited by mixed Assyrian tribes. Karshen: Annexed to the Bateel area of the Zakho constituency and was inhabited by the Tkhoma tribe. Upper and Lower Bastikey: Annexed to the Simeleh constituency and was inhabited by the Tkhoma tribes. Bameri: Annexed to the Bateel area of the Zakho constituency and was inhabited by the Boutan communities. NOTE — There are tens of villages which were not mentioned in this search because of their locations in the areas and constituency of the Nineveh governorate thus the search was limited to the villages annexed to the "Dohuk" Nohadra governorate. Thank you will go to anyone who can give us more information about the Assyrian villages in the "Dohuk" governorate in order to complete this search and publish it as a booklet in the near future… God Willing. Dr. Hashem Khdeir al Janabi. "The city of Dohuk", 1985. The Directorate of General Civil Affairs Registry. Directory of general census for 1965, 13 complete parts. Baghdad -- Iraq. The Christian Intellect Magazine, different issues. Al Tahreer centre. Mar Toma Church. Mosul -- Iraq. Yousif Malik. "The British Betrayal of the Assyrians". First Edition, 1935. Abd al Majeed Haseeb al Qaisi. "The History of the Assyrian Cause in Iraq". A collection of laws and decrees issued by the national Kurdistan council. Publications and studies from different internet sites. Dr. Abdalla Markus Rabbi. "Mangesh: Past and Present", 1999. Hirmis Aboona. "The Assyrians after the fall of Nineveh". Volume V, 1999. Odisho Malko Asheetha. "Asheetha's Book" written in Assyrian, 2002. The names of cities or villages in quotations "----", signify the altered non Assyrian names. The first id to submit to the Kurds (Barazani's movement) and do whatever they wanted but then the Assyrians would have been classified as being against the government and in that case the villages would have been shelled and burned down by the government and that's exactly what happened to many villages when the villagers were divided between those who supported the Kurds and those who didn't so they had to leave. The second choice was to be against Barzani and in that case the government didn't defend the villagers either so they had to leave their villages following many battles and heavy losses as it happened in Sardashte, Halwa and most of the Barwari Bala villages where the Kurdish Agha (Mohsen Barwari) was with the government and against Barzani. Some villages were burned down by the government and others by Barzani. The March - April 1991 uprising of the Kurds and Shiaa in Iraq. In March 11, 1970 Kurdish autonomy was proclaimed in Iraq. The writer means the uprising of Mallik Yaqo against the Iraqi army when they killed many of his soldiers while they were attempting to leave Iraq and cross over to Syria on August 03, 1933. Mallik Yaqo was obliged to defend himself and his soldiers in three victorious battles in Derabon, Feshkhabor and Jyay Be -- Kher. When the Iraqi army was defeated they went and attacked the helpless Assyrian villages in the North of Iraq and massacred thousands of innocent people with the help of the Kurdish and Arab tribes under the motto of Jihad. It happened during the campaign of Agha Potros, trying to re-settle the Assyrians in their lands of Hakkari. The story of burning down the village of Barzan was told by Muhammad Said Agha al -- Shoushi (who passed away recently) and he recalled it as it was told to him by his father Qader Agha who was accompanying Agha Potros in his campaign. Muhammad Agha who is an eye witness said:" When Agha Potros came closer to the village of Barzan and before attacking it, he heard barking sounds coming out of the village. Agha Potros asked his friend Qader Agha about the strange voices. Qader Agha replied that those were the voices of the (Mirideen) (the supporters of Sheikh Barzan) and that they would make these sounds in order to scare away their enemy. Agha Potros answered:" Then it's time for our wolves to attack their dogs". This was the beginning of an attack which didn't take long before smoke was seen coming out of the village while the fighters - supporters of Sheikh Barzan fled to the nearby mountains. "Nestorian": an erroneous name given to the faithful who belonged to The Church of The East following the schisms. "Chaldeans": a name given to the Assyrians of The Church of The East who united with the Roman Catholic See of Rome in 1552 and were given the Chaldean denominational name in order to separate them from their brethren who refused to join Roman Catholicism.